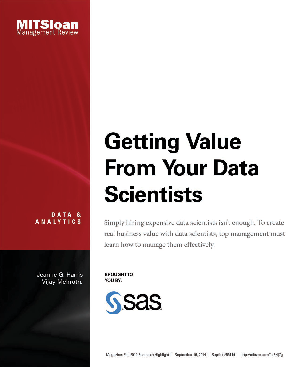 In our own work with companies that employ data scientists, we’ve noticed that the organizations that create the most value from data science are those that seek game-changing insights into the open-ended questions that matter most to the business. For a retailer, it might be, how can we identify previously undiscovered products for cross-selling opportunities? For a mobile phone company, it might be, where can we find new revenue streams to offset the decline in revenues from calls and texts? For a hospital, it might be, how can we translate the written notes on patients’ charts to improve patient care and outcomes?